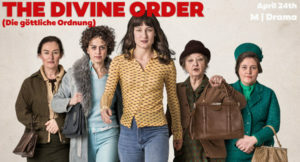 Presenting the Swiss-German Film ‘The Divine Order’ which is set in 1971 Switzerland. This film won several awards at Traverse and Tribeca Film Festival’s 2017 such as Audience Award Best Fiction Film and Swiss Film Award 2017. This captivating film will sell out fast and we guarantee, you won’t want to miss out! Screening April 24th – 7 pm at Big Screen Cinemas Caloundra. Learn more about the film, trailer and ticket purchase here!